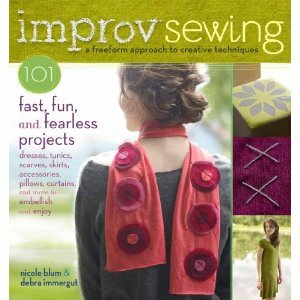 Improv Sewing: 101 Fast, Fun, & Fearless Projects, co-authored with Nicole Blum and published by Storey Publishing in spring 2012, celebrates the possibilities of inexpensive, solid-color fabrics. We use them as an artist uses a canvas – as a starting point for all kinds of creative embellishment — and offer 101 no-pattern, fuss-free projects, from skirts and dresses to home items and gifts. See the book on Amazon.com. booklist Top 10 Craft and Gardening Books, 2012: Blum and Immergut’s lively approach to personalized sewing projects is all about serendipity and enjoying the process, from making patterns to choosing fabric to using innovative embellishments. publishers weekly: This large volume, packed with full-color photographs, is a must-add for sewers who want to work outside the parameters of paper patterns and precise measurements. “It’s about enjoying the journey as your thread travels across the fabric,” Blum and Immergut write, “…and in the end, you’ll have made something lovely and wonderful.” This soothing, empowering style of teaching sewing is a nice contrast to the more rigid directions promoted in other recent sewing books. library journal: Given this book’s title, you may expect pieces that are thrown together with little care. That’s certainly not the approach in Blum and Immergut’s excellent introduction to sewing—they simply want to reduce the intimidation factor….The verdict: an excellent sewing book for beginners, although experienced tailors will also enjoy the simple yet tailored patterns and creative approach. the examiner: The new book Improv Sewing is a freewheeling treasure trove of techniques and projects that range from adults’ and kids’ clothing through bags and home dec to less traditional sewing like trivets and gift tags…Improv Sewing is a truly original and inventive collection of ideas. Photographs and clear directions make the projects enticing, as well as approachable for sewists of varying experience. And hey, I also wrote a book of short stories! It’s called Private Property.